Puerto Princesa Subterranean Underground River National Park is located in the Saint Paul Mountain Range on the northern coast of the island. It is bordered by St. Paul Bay to the north and the Babuyan River to the east. It is about 50 kilometers north of the city of Puerto Princesa, Palawan. Transportation are readily available from the city to Sabang Port. The entrance to the Subterranean River is about three hour hike from the town of Sabang depending on your pace. Since 1992 the Puerto Princesa National Park was supervised by the City Government of Puerto Princesa . The park is also known as St. Paul’s Subterranean River National Park, or St. Paul Underground River. Tip: Beware of Monkey who snatches anything in plastic bags, it is better not to bring any food if you choose to do the monkey or jungle trail. Put on a lot of insect repellant! Warning the trail is very steep specially during wet season. So if you lack the stamina don't even dare! In Sabang you can secure a permit to enter the Underground River @ the yellow and blue building conveniently located besides the basketball court. Downside during peak season, you might be scheduled late in the afternoon or the following day. In which case you would have to stay overnight in Sabang. Because the last trip going back to the city is at 3:00 P.M. Sometimes if there's delay, LAST TRIP is at 4:00 P.M. depending if the jeep is full already. You could also tell the driver that you intend to come back with them. And if worse comes to worst enjoy the beach, immerse yourself with the culture of the locals, sing in the videoke or avail of the mangroove paddleboat tour. They say it was a beautiful experience. I could not vouch it for myself though 'cuz I wasn't able to try it. If you choose a boat ride from Sabang Port to the location of Puerto Princesa Subterranean River National Park ( maximum of 6 people per boat, P 700 divided by 6 is equals to P120.00/pax) 1 whole boat would cost you P 700 plus 3.00 each terminal fee. That's a total of P 718 for a group of 6 people. Prepare coins. RECOMMENDED!!!! I saw 2 americans who wanted to go back by boat but couldn't because they took the 3 hour monkey/ jungle trail going to the Underground River. ( nagtitipid?? Maling pagtitipid ) Almost all the boats going back to Sabang Port are full. Popularly known as the Palawan Underground River, this magnificent beauty found in Puerto Princesa, Palawan in the Philippines average around five hundred(500)tourists per day during peak season. With the more specific name of Puerto Princesa Subterranean River National Park, it is one of the New Seven Wonders of Nature. It was inscribed by UNESCO as a World Heritage Site on December 4, 1999 similar to the Banaue Rice Terraces (in 1995). The Palawan Underground River is a Subterranean Thrill with 8.2 kilometers of navigable river underneath a tunnel with stalactites and stalagmites. 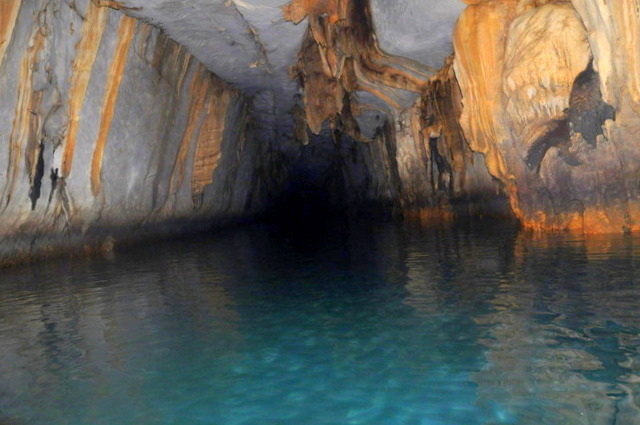 It is the world’s longest subterranean river located in Sitio Sabang. Bats and insects live inside the tunnel creating some unpleasant smell during the cruise. A guide with a paddle-powered outrigger and a lamp takes you inside the Palawan Underground River. The local government collects a permit fee of P 150/person. To be paid in their new office in the city. The permit is inclusive of entrance fee and a 45 minute-boat ride inside the Puerto Princesa Subterranean River National Park, plus the use of lifevest and helmet. Usually, a group of 4-6 people ride the paddle-powered outriggers going inside the Palawan Underground River. Head lamps are very useful during the trip so you can see what’s inside. Tip: Do not ride in front of the boat, the one in front will be the one holding the lamp for the entire duration of the underground cruise. The Park is open to the public the whole year round. However the best time to visit is from January to June when the weather is drier making it easier to get around. Other activities which can be enjoyed in the National Park are jungle trekking, wildlife watching, mangrove paddleboat tour, and swimming/snorkeling in the white sand beaches. For more information, you can check Palawan Underground River’s official website at http://www.puerto-undergroundriver.com. You can contact them at telephone number (+63)(48)434-2509 or email them at info@puerto-undergroundriver.com. Tip: Cave photography is not an easy task specially while in a boat. Your ideal set up would be a point and shot with a hot shoe, a flash, a wireless trigger to set off your flash off camera, a powerful lamp to help you to focus on your subject and a dry bag that could fit all you gears . Unless it's a photo trip, don't bring slr because it's bulky and focusing with your camera's live view would not be easy, you have to do it manually with a powerful head lamp to help focus on your subject. Using your on board flash is also your best bet, but orbs from water particles due to humidity will be all over your photo specially when shooting at high iso. You can get rid of those orbs in photoshop but you will loss a lot of details and time doing it. Hope this helps. Happy shooting.